Advanced mute casters. two layer drawer, lower part is bifold door structure. Stainless steel fence, ABS table (with protection soft glass), anti-collision ring. steel-plastic column, central locking, single (double) layer dump, trash. Configuration: The vehicle is made of plastic steel, beautiful and strong, with good handling. 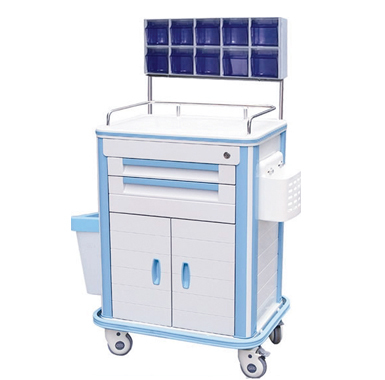 Looking for ideal Two Layer Drawer Anesthesia Cart Manufacturer & supplier ? We have a wide selection at great prices to help you get creative. All the Advanced Mute Casters Anesthesia Cart are quality guaranteed. We are China Origin Factory of Bifold Door Structure Cart. If you have any question, please feel free to contact us.